One of the most popular starter on our menu is currently the steamed Exmouth mussels. The mussels are ordered in fresh every day. They are served in a smoked bacon and white wine creamy broth with slices of garlic and parmesan ciabatta on the side. It can either be ordered in a small or a large portion, depending on whether you want to have it for a starter or a main. The Exmouth mussels are extremely high quality. 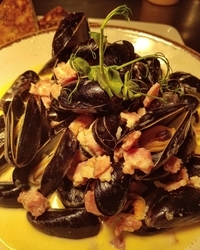 Chef Steve Gilbert said: “These are some of the best mussels I have ever worked with, they have excellent flavour.” If you are a seafood fan, make sure you come and check these out soon.